With so many leagues around the world, BetStars is your destination for the best soccer betting markets in the world. 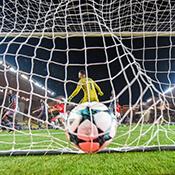 Detailed coverage of the Premier League, La Liga, the UEFA Champions League, as well as MLS and international soccer we’ll provide you, as you can score betting goals with our expert takes on which teams and players will score the most goals. The Champions League is back for its dramatic knockout stages! And we at BetStarsUSA have you covered for soccer's premier club competition, as it enters its captivating Round of 16 stage.